June 28, 2013. DFI Eric Varty advises that his Canopache has been sold to Kevin McManus. Below are his email (minor edit) and parting pictures. We are standing by for the new owner to check in. 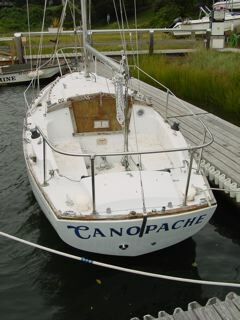 I have the sad duty of informing you that I have sold Canopache, Hull #188. 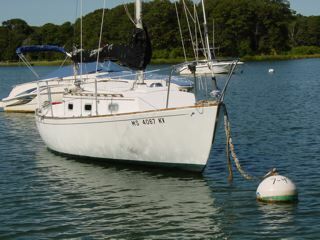 I am very happy to report that I sold her to Mr. Kevin McManus of Marblehead Massachusetts. She is the second Dolphin he has owned and was not daunted by the long To Do list that she came with. He indicated that he had Marscot Hull # 18 and years ago, after restoring her and with a growing family sold her to someone in his area. He has tried to buy that boat back since but to no avail. The current owner is too happy to continue his affair with her. Kevin indicated he would get in contact you. He seemed interested in the site and the gold to be mined there. Kevin and Canopache are ready to roll. Her new chapter begins. I appreciate your efforts on behalf of the Fleet and will continue to follow the Saga and antics of the very dedicated Dolphin community. Perhaps one day I will return to the trough myself. Fair well, fair winds, and following seas. 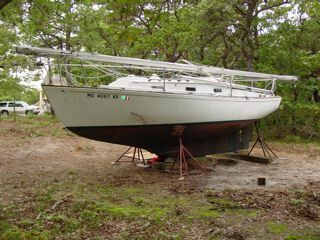 I have re-listed on Cape and Islands Craigslist for $2,500.00 for the pair under "Dolphin 24 Sailboat with Trailer". I want them to both go together as I have storage issues. Hi Ron, Canopache is forlorn. She cries for attention that I simply do not have time to give, so, reluctant realist that I am, I have put her back on the market. I have been thinking to sell anyway. "Trina" has always been a secret mistress for me and now that her cost is in range.... I started early in life building wood boats with my dad, and began working life as a yard rat in the wooden boat yards of Port Washington L.I. I still have a sincere appreciation for the wooden beauties. But then there is the matter of time. A hard fact in life sometimes. I will always follow the site, and as things inevitably change will one day be interested in having a Dolphin again. 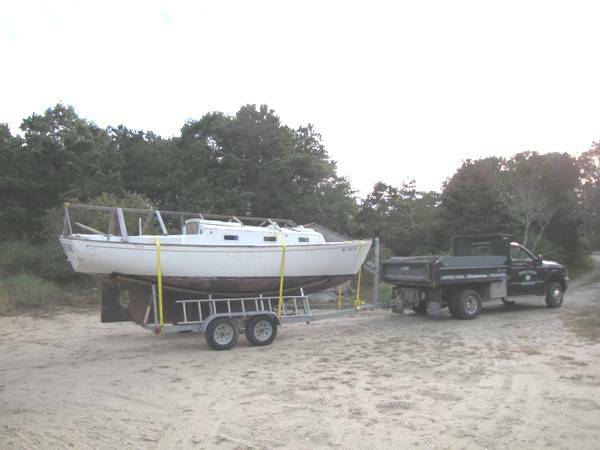 Project boat on a great trailer! 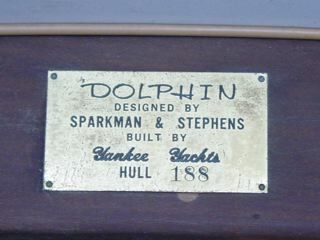 1970 hull #188, Sparkman and Stephens designed MORC sailboat. 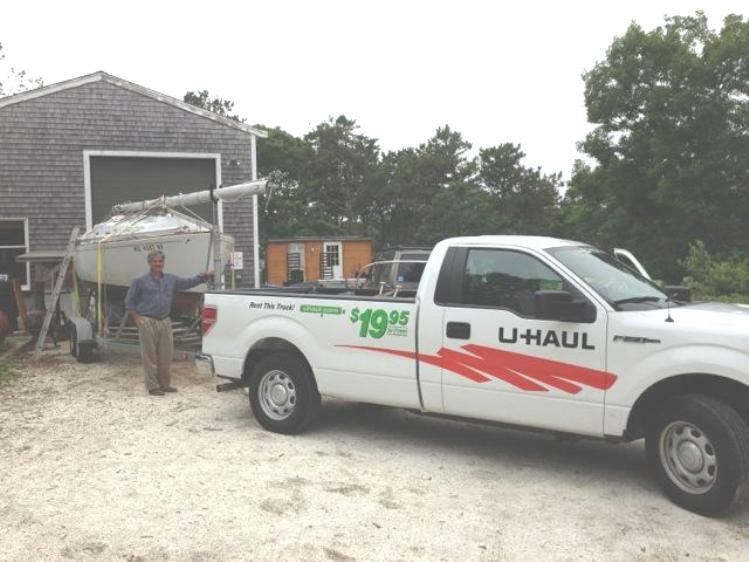 Trailer is galvanized with only about 1500 miles, dual axle, brakes and spare. In great condition. 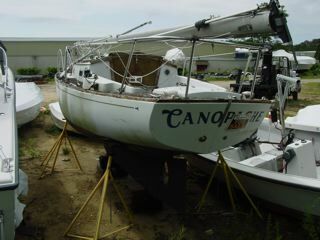 Boat is a project just started. 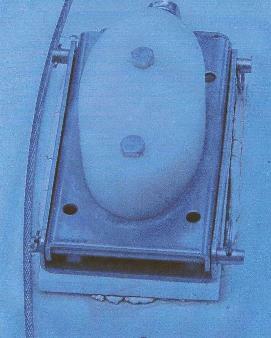 Sound hull, frozen inboard motor. Good sails and spinnakers, jiffy roller reefing main, roller reefing jib. Lots of pieces and parts, lines and gear. 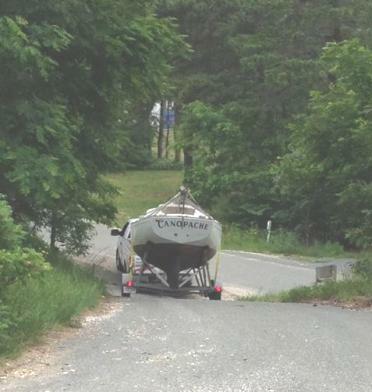 This boat needs skilled attention but the trailer is ready to go! Changes in situation make it difficult for me to continue with restoration. Here is how we found out about Canopache. On July 27, 2007 Eric checked in Canopache with the following pictures, and a love story. A short story and a few pics for your information. OH MY GOD! WHAT HAVE I DONE? I fell in love and forgot to look at her teeth! Last summer, while on a materials run, I saw Her through the trees. I looked and lusted. I called and was told she was available for $1,500.00. I was told that the boat had gone through a divorce, was rescued by her Captain, transported to the Yard and abandoned there without a cover. While in the hands of the Ex her cover rotted off. 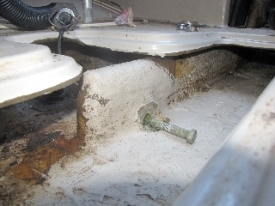 With the drain plug still in place rainwater had risen to 18", mixing with oil and bilge goo along the way. 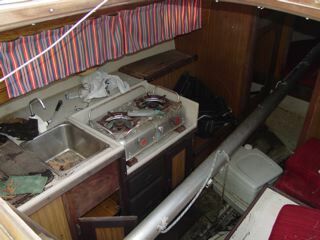 It saturated the cabinetry and rusted out the inboard engine, trashed the cushions, corroded the stove and generally make the interior an inhospitable place. She was a real mess! Against all reason, I lusted some more. (This is a dangerous state of mind!) I searched the net, downloaded the original brochure from S&S, and found the article in Good Old Boat! I found that the name "Canopache" is Wampanoag Indian (native to the Cape and Islands) for "place of peace" and also their word for Nantucket! I was hooked! Such a beautiful creature deserves loving care. A couple of tormented months go by and a friend offered a place with electric and power That did it! Against all reason I called the Boat yard. I was told they just the day before they had given it to a young man who worked there. He had stepped the mast and the boat was lying at mooring in East Orleans. BUMMER. This just was not meant to be. I decided that the info I had collected would better serve the new owner than the circle file so I gave it to him along with my email just in case he changed his mind. The call came a week later. It seems after a few parties on the boat and a few discussions with his wife about the priorities of boats and babies [one child is the equivalent of one 42 footer]that he would love to have me be the next to enjoy the rights of ownership. The deal was done for $1,000.00, and she was moved to her new hard location in the woods, inventoried, and covered for the winter. A couple of months go by and my "landlord" allows that his neighbors are restless! 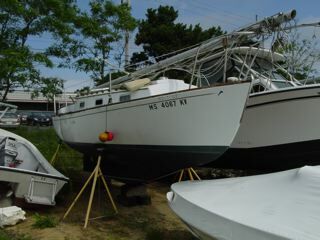 I am looking for yet another place for the boat- or maybe try to sell/give it away? Serendipity would have no parting. I found a barn to work in and a space next to it for the boat!. She will be moved there after a Captain/surveyor friend comes to give me the really hard truth of my folly! My dreams still see Her with a new interior(with an open plan), a new diesel power-plant, and all bright and shiny! This is going to be a long process but love shall conquer all! Thanks, Ron, for your contribution to our dearest love! I am psyched! 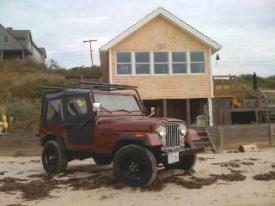 I am just realizing that I have worked Canopache up toward the top of the to do list [photo ofcompleted Jeep and Cottage attached]. 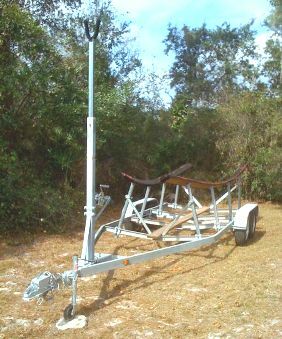 I have made a deal to acquire a one owner, never titled, never on the road, galvanized, two axle with brakes Sailboat trailer for a very good price. This IS adding fuel to the fire!!! Next summer I will erect a work shelter around the old girl to facilitate an ongoing project. December 17, 2009. Erik has sent in more informarion about his newly acquired trailer mentioned above. It is a 6000# (6960 GVW) set up for a boat that was 25' overall with a 19' waterline, 8' beam, 3'-6" draft, and 5120# displacement. This, and additional information, has been added to our Technical/Trailers Section. Click to go there. Eric sent in an interesting report regarding his fiberglass wrapped stainless steel centerboard. The full report is in our Technical Section/Centerboards. Click here to go there. The beer is cold, the ribs are ready to go, the friends are on tap for tomorrows mating of Canopache with her trailer. I adjusted the carriage to specs gleaned from the website and am excited by the prospect of seeing progress! Friends have offered to park her without charge so that I can hold on to the girl for a few years till I really can apply myself to her restoration. One of the main reasons for placing her on the market was the cost of keeping her where she was. p.s. Phew, that was close!